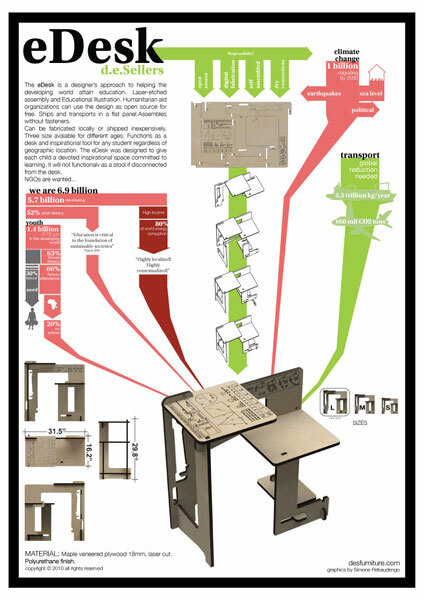 David Sellers, who earned a Bachelor of Environmental Design degree in 2002, said his eDesk, which can be fabricated locally or shipped in a flat panel and assembled without tools or fasteners with instructions on the panel, is a designer's approach to helping people in the developing world get an education. "It was designed to give each child a devoted, inspirational space committed to learning," he said, adding that three sizes of the desk are available for students of various ages. "It functions as a desk and inspirational tool for any student regardless of geographic location," he said. Humanitarian aid organizations, he said, can use the design as open source, and he's hoping nongovernmental relief agencies can help distribute the desk. Sellers was one of 550 exhibitors of contemporary furniture, seating, carpet and flooring, lighting, outdoor furniture, materials, wall coverings, accessories, textiles, and kitchen and bath for residential and commercial interiors at the fair, which took place in the Jacob Javits Convention Center. The ICFF draws the most intrepid seekers of design truth and design trends to an extraordinary exhibition of the most inspired models of design," said an entry on the ICFF homepage. The gathering of national and international exhibitors, said the site, presents the most selective scope of the world's finest, most creative, individual, and original avant-garde home and contract products.